The funnel chanterelle is a good mushroom for eating; it can be prepared in the same ways as the common chanterelle (Chantarellus cibarius), familiar to all. Judging from their looks the relationship however may seem questionable. This year, without marked droughts, suits the funnel chanterelle, and we can find them in great numbers until a permanent snow cover arrives. Light frost and a few days with slight snow don’t hurt them. Habitats are conifer and mixed forests, preferably humid. The diameter of the cap is up to six centimetres, as young with an inwards-rolled rim, later unfolded, lobed and irregular. The colour is greyish-brown to dark brown. The stem is thin, hollow, tough and pale yellow to dark yellow. The mushroom flesh tested in the forest tastes bitter and smells faintly of earth. Our northerly neighbours value the funnel chanterelle highly (in Finnish: suppilovahvero) and it is slowly gaining popularity in Estonia too. 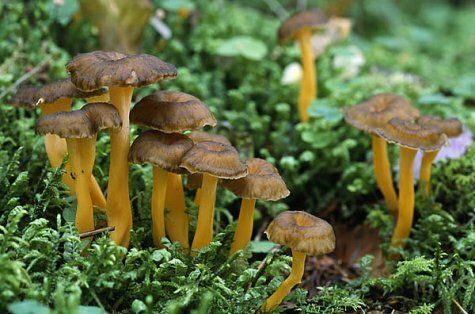 A similar species, the golden chanterelle / Cantharellus aurora/ grows in similar habitats and often the same forests as the funnel chanterelle. It is also a useful and delicious edible mushroom.